Reference number for this case: 19-Sep-54-Vaudreching. Thank you for including this reference number in any correspondence with me regarding this case. Aimé Michel reports that on September 19, 1954, in Vaudreching, René Paul, electrician, sees an elongated object having "the luminosity of a neon tube" pass by. The two authors indicate, in the context of the observation in Tromborn, that within six kilometers from there, that is in Vendreching, an electrician, Rene Paul, saw an elongated luminous object passing, that the witness expert in luminary compared to a "neon tube." Vaudreching: Mr R. Paul observed a lengthened object of a brilliant green color. 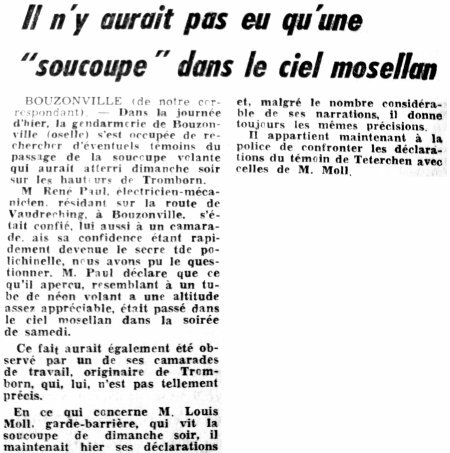 Luc Chastan indicates that in the Moselle in Vaudreching on September 19, 1954 at 21:15 hours, "a witness observes a lengthened object having the luminosity of a neon tube." [am1] "Mystérieux Objets Célestes", book by Aimé Michel, Arthaud publisher, France, page 85, 1958. [gl1] "Face Aux Extra-Terrestres", book by Charles Garreau and Raymond Lavier, Delarge publisher, J'ai Lu, France, page 225, 1975. [am1] "Mystérieux Objets Célestes", book by Aimé Michel, Seghers publisher, France, page 85, 1976. 1.0 Patrick Gross June 16, 2009 Conversion from HTML to XHTML Strict. First formal version. Addition [lc1]. 1.3 Patrick Gross September 29, 2017 Addition [ub1].